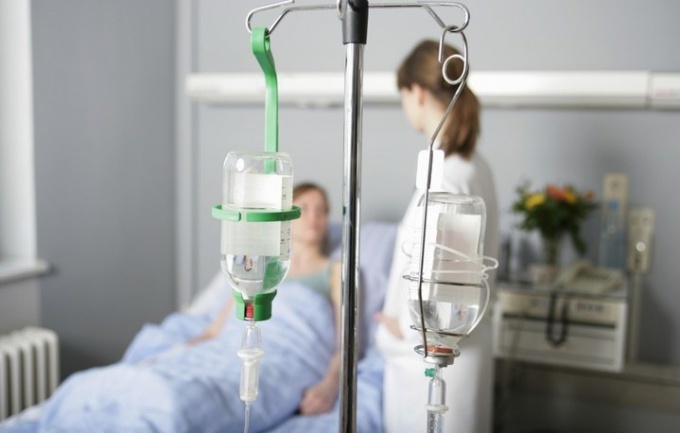 Dropper or system for intravenous infusion is a device intended to inject fluids into the human body. The system connects to the bottle of the medicine on the one hand, with Vienna on the other. Production dropper requires certain skills. How to install it yourself? Lay the patient on the couch or put so that one of his arms was bent at the elbow and was placed on a firm horizontal surface, e.g. a table. Put next to the patient a tripod. Treat the hands with an antiseptic solution. Put on sterile medical gloves. Tear from the coils of the adhesive tape 2 strips with a length of 3.5-4 cm and attach them to a tripod at one end. Using scissors, open the metal cap of the vial with a solution which you are going to enter. Treat 70 degree alcohol the rubber stopper of the vial. Open the package with a syringe. Collect it. Remove the vials of drugs that must enter into the vial. Open and type the contents into the syringe. Pierce the rubber stopper of the vial and pour in a medication from a syringe. Open scissors packaging system for infusion. Take the end on which the cylinder air-valve and enter the thick needle on the end into the vial. Close the system with the wheel, turn the container of medication and place it in a tripod. Open the air valve. Squeeze your fingers between the cylinder and fill it with liquid from a bottle in half. Remove from the opposite end of the needle, point the end of the tube in a tray or sink. Open the wheel and fill the system until the end. Ensure that the tubes did not appear bubbles. Close the wheel and put on the beveled needle system. Put the elbow of the patient a sterile cloth. If his hand is on the table, and he sits, in addition to wipes you'll need a low pillow that allows you to lock the arm in a bent position. Put on shoulder harness and ask the person to vigorously compress and unclench the fist. Feel the elbow vein. Clean the skin over it with a cotton ball with alcohol. Press the vein below the intended place of puncture with the thumb of the left hand. 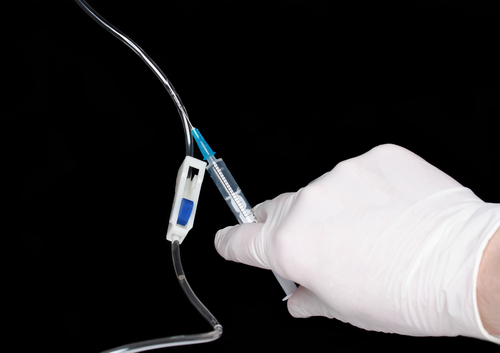 Right hand remove the cap from the needle system and pierce the skin parallel to the vein and then the vein itself at an angle of 45 degrees thereto. When injected the needle into the lumen of the vessel you will feel the sense of failure. The needle should appear dark blood. Left hand untie the tourniquet and open the wheel system. Gently release the needle cannula and lock it by strips of sticking plaster taped to the tripod. Adjusting the dial, set the desired rate of drug administration. Do not put the dropper in their own home. The first time install the system under the guidance of experienced medical personnel.